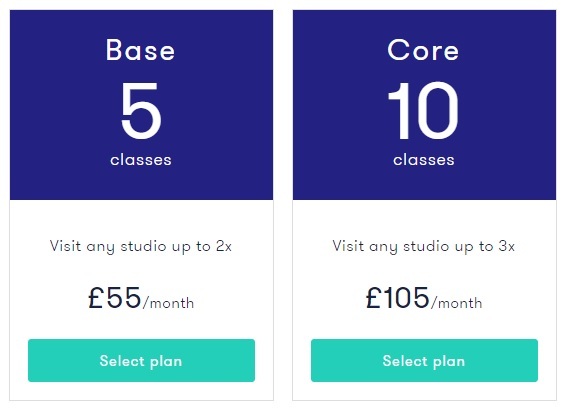 ClassPass is a monthly fitness membership that connects you to thousands of the best fitness studios around London. This kind of membership allows you to enjoy many different and exciting ways of working out without being tied down to one type of studio. The company offers 2 membership plans. Depending on the plan, you’re able to attend either 5 or 10 classes a month. These 2 plans differ in the limitation of the number of times you can attend the same studio. The sessions do not get carried over to the next month so you will lose the sessions if you do not make use of all of them. A few month’s ago I wrote about my boxing experience earlier this year. When I finished the boxing course, I decided to terminate my gym membership as I was bored and not making much use of it. I started looking for alternative fitness memberships and liked the sound of ClassPass. Fortunately I was able to find a deal on Facebook that gave me a 3 month ClassPass membership for £27 a month (50% off the normal price £55 limited plan option) meaning I could attend 5 classes per cycle. You have the option to book your classes through the ClassPass website from your PC or a mobile app. 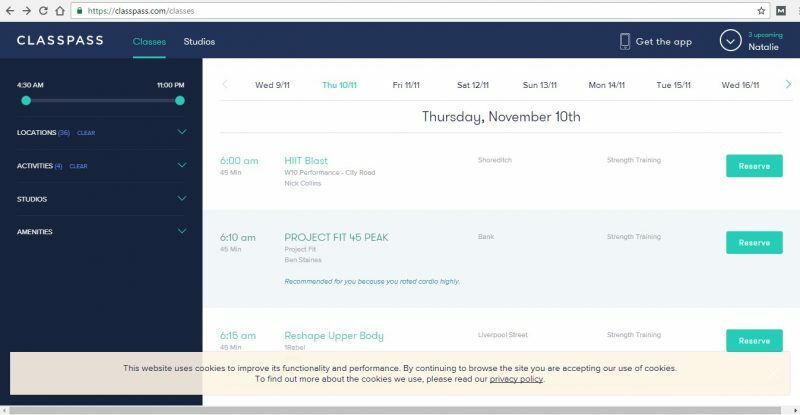 The screenshot below gives you an idea of the ClassPass booking system. The bar on the left hand side allows you to choose the time range, the location, type of activities, specific studios and available amenities. You will then get an email notification of the class that you’ve reserved and a reminder beforehand. If you’re unable to attend a booked class and cancel with enough notice then you don’t lose your session. After each class, you are asked to rate the class you attended. These ratings are also used for recommending future classes to you. I am incredibly impressed with the variety that ClassPass offers. As I get bored easily, this works well for me. I love that it gives you an opportunity to try many different gyms/fitness studios that you may not have known about before. This was the first time I tried a Powerplate class which was only 30 minutes long. As there are only 7 machines in the small studio I found the atmosphere friendly and personal. If you don’t know what a Powerplate workout is then check it out on Youtube. Initially the workout on the Powerplate machine felt absolutely weird. There were vibrations in my head and throughout my body. We started off with a warm up by stretching on the Powerplate machine. Next we moved on to exercises on the machine with additional equipment such as dumbells, a medicine ball or a kettlebell. We also did a few aerobic exercises, stomach exercises and push ups. The session then ended with a cool down and a massage on the machine using the highest level. By the end of it some of my muscles already started aching which turned into stiff sore muscles for 3 days afterwards! The workout sounded a little too good to be true to me but I have actually been back again. This small gym is located in the basement of an office block near Cannon Street. I really like the concept here as it makes personal training more affordable by working out in small groups with a personal trainer. There was a group of 4 us taking part in the 45 minute long session. As you can gather from the name of this session, it involved lots of leg and bum exercises doing mat work and using kettle bells. When I read about this workout and discovered that it was close to my previous workplace I had to give it a try! 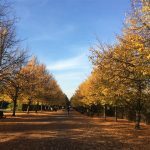 The Skinny Rebel Workout is Train Dirty London’s signature high intensity, full body workout with the option of wearing an altitude mask. The pictures looked a little scary but I was intrigued to find out what this workout was all about. Train Dirty London is based in the gym facilities at the Conrad Hotel near St James Park station. Sheepishly I booked this 45 minute workout for my lunch hour not knowing fully what to expect. As I was the only one that booked this session, I had the luxury of a personal trainer to myself. 5 rounds of high-intensity interval training combined with body weight exercises later, I was almost broken…absolutely pooped! Every time I thought I caught my breathe, I was huffing and puffing again. I attempted to use the altitude mask but found it a little overwhelming as I was just too out of breathe! This workout definitely highlighted my fitness levels and how much they need to be improved on. Now I know the name of this class sounds rather naughty but it is nothing of the sort! 😉 The concept is a hard hitting, 45 minute workout crammed into half an hour. I really liked this studio and the idea of this workout. The training room is filled with treadmills lined up against a wall with sturdy workout benches placed behind them. 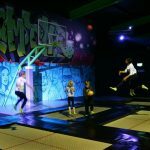 Strobe lights in a darkened room with motivational dance music pumping through the speakers created an almost club like atmosphere. The exercise routine alternated between sprints on the treadmill and dumbbell exercises on the bench. I had to smile to myself as I have often thought of doing a similar workout in a gym. I’ve always enjoyed doing spinning classes but I haven’t done one in a while. I was keen to try this studio as they’re ideally located for me. This studio is kitted out with top of the range bikes that are completely adjustable allowing you to set them up according to your body size for the most comfortable ride. Each bike is fitted with a console which allows you to track and record progress. A leader board is also displayed at the front of the studio. If you choose to opt in, your performance data will appear on the screen enabling you to compete with other riders. I was impressed with the setup and the quality of the studio but unfortunately a bit disappointed with my workout. The class in my opinion was a bit boring and didn’t have enough variety. I’m keen to try another instructor though and will definitely give the place a try again. Out of the classes I’ve tried so far I was most impressed with the Powerplate, Skinny Rebel and Quickie workouts. I still haven’t decided whether I shall continue with the membership once the deal runs out. But so far I’m loving the variety of workouts ClassPass has given me the opportunity to experience! If you’re keen to try ClassPass then please use my referral code to get £30 off your first month by clicking here. 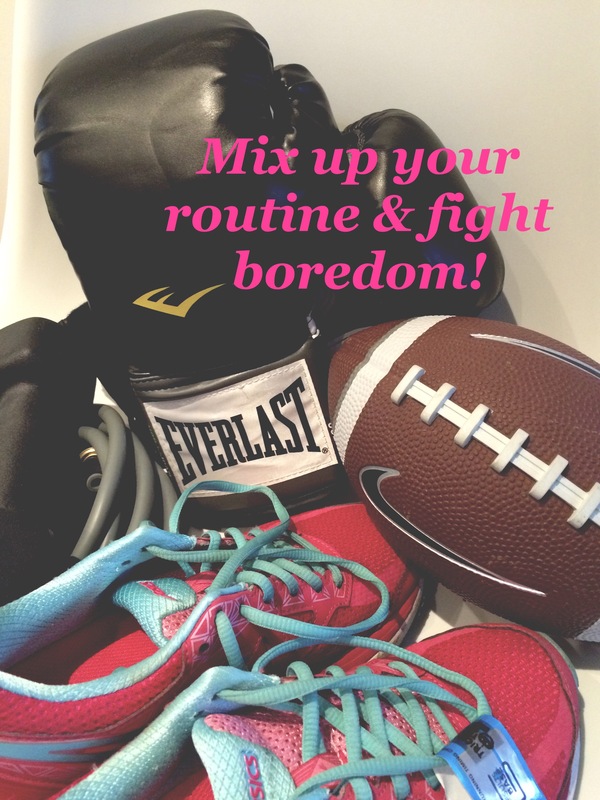 Have you tried any of the ClassPass classes? I’d love to hear in the comments. This post contains affiliate links. This means I get something back if you decide to sign up but you’re not charged anything extra. Thanks! Like the sound of Class Pass – seems like a good deal and it is so nice to be able to try different gyms! Yes, ClassPass really came up with a good business idea there! This is such a good idea, I like the sound of the class pass and there are so many good sounding classes! Hi Rachel, the choice is so vast I end up taking way longer than expected to decide on a class lol! I like the sound of this class. Will look it up. This is a great idea as you don’t get bored!